Russia has accused US President Donald Trump of "boorishness on a global scale" after he insisted that Russia should "get out" of Venezuela. Mr Trump made the remarks after the reported deployment of Russian troops and equipment to Venezuela. Russia is a key ally of Venezuela, lending it billions of dollars and backing its oil industry and military. It has also vocally opposed moves from the US to impose sanctions on the government of President Nicolás Maduro. The South American nation is undergoing a deep political and economic crisis amid claims that Mr Maduro's re-election last year was rigged. In January an opposition leader, Juan Guaidó, declared himself interim president and is backed by the US and some South American and European countries. 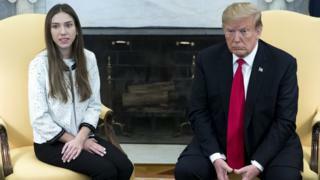 "Russia has to get out," Mr Trump told reporters on Wednesday during a meeting at the White House with Mr Guaidó's wife, Fabiana Rosales. Asked how this could be accomplished, he replied: "We'll see. All options are open." Russian foreign ministry spokeswoman Maria Zakharova condemned Mr Trump's remarks in unusually undiplomatic language. "What does it mean, get out? Is it the tourists who have to get out? Is it the energy companies that have to cancel their contracts? What does it mean, get out?" she said in remarks quoted by the RIA Novosti news agency. "To tell Russia to 'get out of Venezuela' is going completely over the top. This is total boorishness on a global scale." She added that there were no "legal let alone moral" grounds for Mr Trump's demand. Russia has said its presence there is in line with the defence co-operation accords between the two countries. "We do not think that third countries should be concerned about our bilateral relations with some states," Russian President Vladimir Putin's spokesman Dmitry Peskov said in remarks quoted by the Russian news agency Tass. "We are not interfering in the internal affairs of Venezuela in any way... we hope that third countries will follow our example and let Venezuelans decide their own fate." He added that the US had a presence in many parts of the world, but "no-one tells them where they should be and where they shouldn't be". Why did the row break out? Two Russian military planes landed at Venezuela's main airport on Saturday, reportedly carrying dozens of troops and large amounts of equipment. The planes were sent to "fulfil technical military contracts", Russia's Sputnik news agency reported. Javier Mayorca, a Venezuelan journalist, wrote on Twitter that he saw about 100 troops and 35 tonnes of equipment offloaded from the planes. A military plane with a Russian flag on its fuselage could be seen on the tarmac at an airport on Sunday. Images on social media also appeared to show Russian troops gathered at the airport. On Monday, US Secretary of State Mike Pompeo spoke on the phone with his Russian counterpart, Sergei Lavrov, urging Moscow to "cease its unconstructive behaviour" in Venezuela. Ties between Moscow and Venezuela have strengthened in recent months, amid worsening relations between the US and Venezuela. In December, Russia sent two air force jets there as part of a military exercise. Russia has condemned other foreign powers for backing Mr Guaidó. President Maduro has accused Mr Guaidó of trying to mount a coup against him with the help of "US imperialists". Mr Maduro narrowly won a presidential election in April 2013 after the death of his mentor, President Hugo Chávez. He was elected to a second term in May 2018 in an election seen as flawed by international observers. Venezuela has experienced economic collapse - inflation was 800,000% last year. Three million people have left. Mr Guaidó has accused President Maduro of being unfit for office, and won the support of many in the country as well as US and EU leaders. The Maduro government is becoming increasingly isolated but Moscow has expanded co-operation with Caracas - increasing arms sales and extending credit.